As you know, Dr. B and I are fascinated by the new generation of tattoo culture sweeping the world right now. in 2013, more than ever before in history, tattoos are becoming a more acceptable choice in mainstream culture and workplaces. There is a new type of tattoo ink on the scene, offfering more discreet tattoos in regular light, and more outrageous tattoos in UV or black light. UV tattoos or blacklight tattoos are permanent tattoos made with a special ink that is visible under an ultraviolet light (blacklight). Depending upon the ink, they can be nearly invisible in non-UV environments, thus they are a popular consideration for people seeking a subtler tattoo. Many people have been experimenting with less permanent neon ink options in blacklighted club environments for decades (see photos below for both options). I suspect that the UV tattoos trend developed because of the modern club culture. They are “FDA approved,” yet some fear allergic reactions to the ink. Those that have used ink, such as “Skin Candy” seem extremely pleased with the sharp neon colors and lack of skin reactions. What do you think? 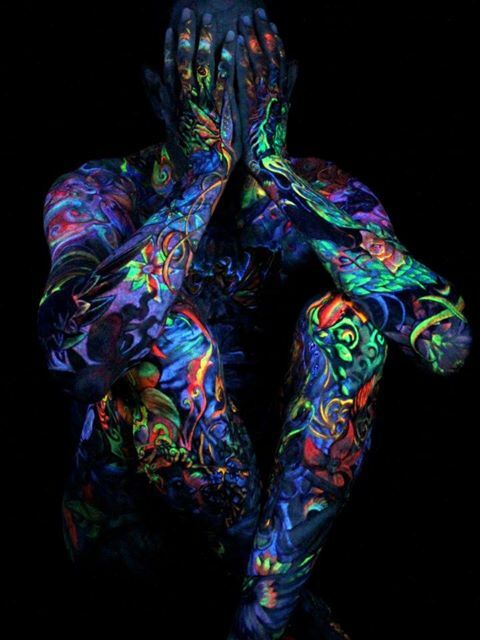 Would you get a UV tattoo?